On the 25th August 2016, PELUM Kenya held an Organic Agriculture Market Forum at the Sportsview Hotel, Kasarani. 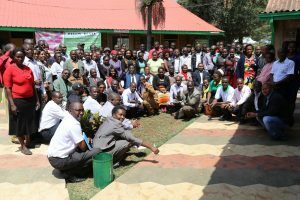 The forum brought together over 100 participants comprised of PELUM Kenya Member Organizations, farmers, organic traders, organic input suppliers and organic support services; certification bodies, government representatives and financial institutions. Four panelists’ sessions comprising of key organic market players were held with interactive plenary sessions. Some of the successful organic traders such as Kate’s Organics, Winnie’s Pure Health, Organic Farmer Market, Jungle Nuts and Bridges Organic Restaurant actively took part in the event. Later in the day, an organic exhibition by farmers, traders, input suppliers and organic support bodies was held. The forum provided a forum for linking the organic enterprises to market opportunities for livelihood improvement.